When my little terrier rescue, Ginger, came down with a horrible bacterial infection that caused open sores all over her body, her veterinarian diagnosed her with possibly have a canine form of leprosy. She was so sick that the only thing she would attempt to eat was homemade food. I’d steam rice and a few carrots, boil chicken and cut them into small pieces before mixing them all together. This home-cooked dog food nourished her and helped keep her alive while she was taking massive doses of antibiotics. She survived, and I stopped making her special meals. Instead, I found she would tolerate Rachael Ray Nutrish Natural Chicken & Veggies Recipe dry dog food. It’s the only dry food she would eat. Recently when I was approached to have Ginger try PURE Dog Food. I requested samples of the food to see if it passed Ginger’s finicky taste buds. Within two days a refrigerated box arrived with an array of with plastic containers of home cooked proteins and fresh vegetables. There were also four small brown bags with different types of treats. I was informed in an instruction letter to ease Ginger into the transition of PURE Dog Food for about one week. On the first day, I was to mix one part of PURE with four parts of Ginger’s current diet. Throughout the week I could increase the percentage, as I monitored how she responded. By the end of the week, I could start feeding Ginger 100% PURE Dog Food and completely phase out her old diet. I didn’t need to wait a week; she loved PURE from day one. I started her on the Popeye Puppy food. Even though she is not a puppy, but more advanced in years, I gave her a spoonful to try. She wolfed it down. It’s made with all natural chicken breast, brown rice grains, sweet potatoes, rolled oats, spinach, canola oil, salmon oil, multivitamin and mineral supplements. Filled with anti-inflammatory nutrients, this food promotes good bone health and helps improve her coat. Researching about PURE I discovered that Lindsay Gores’ organic pet food company is in Southern California. 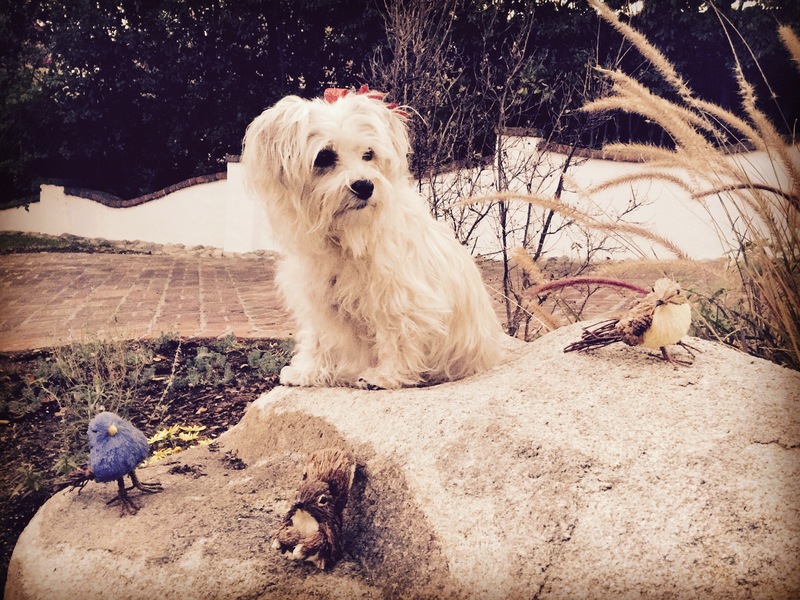 When her dog Zoey was hit by a car and traditional care was not helping her get better, Gores turned to a holistic nutritionist for help. She recommended that Gores feed Zoey home-cooked meals with a little protein and vegetables. 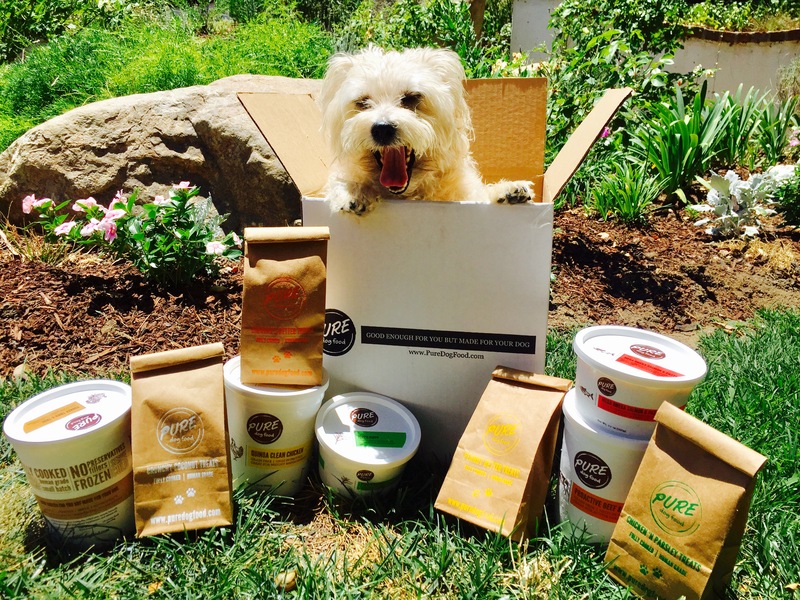 Gores experimented in the kitchen and created the recipes that she now sells in her PURE Dog Food store in Culver City, at Erewhon Market, and online. Zoey got better eating the small batches of simple ingredients without fillers, additives or ingredients. I read in Dog Naturally Magazine that “Dogs and people share roughly 75% the same genetic makeup, and we have similar nutritional needs.” The article goes on to state that ”people food” is good for dogs. “People food is only bad for dog food makers.” What we’re doing to our own health with processed foods, we’re also doing to our dogs. And it’s happening faster. The next day, I fed a couple scoops of Quinoa Clean Chicken with pumpkin puree, red delicious apples, carrots, green beans, salmon oil, multivitamins and mineral supplements. What I like about PURE is that when I remove the plastic lid, I can see each of the ingredients chopped into small pieces. It’s not like a typical pate dog food in a can. 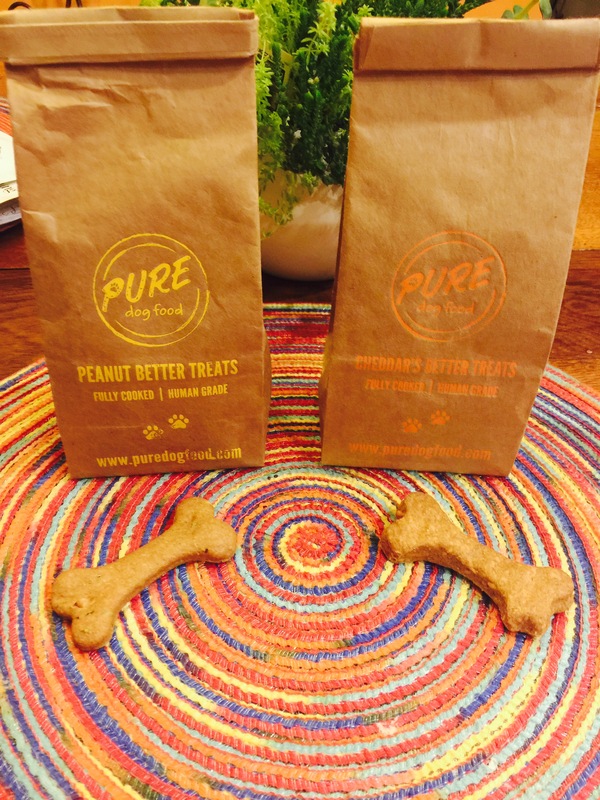 The PURE treat bags are filled with dog-shaped peanut butter bones. All are fully cooked and human grade. I thought, “We could share a bone together,” because they are made with whole ingredients; wheat flour, water, peanut butter, mint and parsley. The last two ingredients aid in digestion and promote fresh breath. I took a tiny bite and noticed it was hard, dense and not very sweet. The Cheddar’s Better treats are fully cooked and human grade, so I nibbled a tiny amount of this bone. It actually was quite good. The ingredients included whole wheat flour, cheddar cheese, chicken broth, garlic powder and olive oil. I could taste the pleasing garlic essence in this bone. Biting into a crunchy bone coconut treat made with coconut flour, tapioca flour, flaxseed meal, beef broth, olive oil and nutritional yeast, I knew this might be a favorite for Ginger, because I found it appealing. Ginger liked it, yet preferred the Chicken ‘N Parsley Treats made with just chicken breast meat and parsley. They are cut thin and resemble potato chips. These were her favorites. What I also like about this food, is it has a long life, so you have enough time to use the entire container and there is no waste. For those who join their subscription, PURE is offering a 50% off discount on the first order. The coupon code is SUBSCRIBE at checkout. 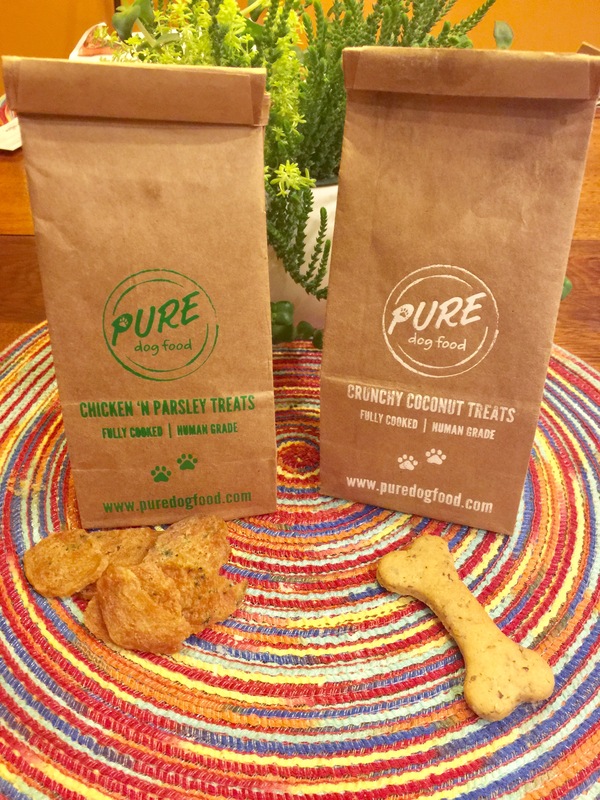 Go to https://www.puredogfood.com/.